A festival of theatre to commemorate the 79th birth anniversary of 'Sudu Seeya' Henry Jayasena will be held at the Lumbini theatre from July 6-8. His demise last year was a heartfelt loss to the theatre industry and in memory of this great thespian and actor, a special festival will be held in his honour. "Thavath Udesanak" a play written and produced in 1964 will take stage on July 6, which is the birth date of Henry Jayasena. Two of his other masterpieces "Kuweni" and "Hunuwataye Kathawe" will be staged on July 7 and 8 consecutively. Henry Jayasena was born on 6 July 1931 in Bendiyamulla, Gampaha. Having studied at the Gampaha branch of Lorenz College and at Nalanda College Colombo, he began his career as an Assistant Teacher of English at the Dehipe Primary School in Padiyapellela in the Nuwara Eliya district in 1950 where he directed his first play, 'Janaki'. Jaysena left this post a few months later after passing the General Clerical Service Examination and securing a job with the Public Works Department (PWD) of Sri Lanka. While with PWD, Jaysena created many of his most famous plays, Janelaya (1962), Thavath Udesenak (1964), Manaranjana Wedawarjana (1965), Ahas Malilga (1966), Hunuwataye Kathawa (1967), Apata Puthey Magak Nethey (1968), Diriya Mawa (1972), Makara (1973) and Sarana Siyoth Se Puthini Habha Yana (1975). Before retiring from government work, he also served as Deputy Director for the National Youth Services Council (Arts and Sports Division) and the Sri Lanka Rupavahini Corporation (Programmes Division). Also during this time Jaysena was a reputed film actor. An early role was in Sri 296 (1959). During the 1960s, Jaysena played the starring roles of Piyal in Gamperaliya (1964), Azdak in Hunuwataye Kathawa (1967) and Lalith in Dahasak Sithuvili (1968). 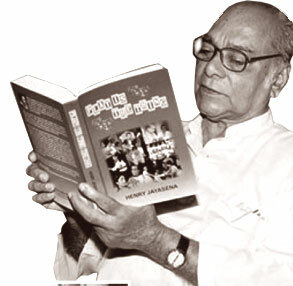 Dr Henry Jayasena died on November 11, 2009 in Colombo, Sri Lanka.